Social scientists' analysis of 290,119,348 tweets from 193,522 "politically engaged" Twitter users during the 2012 presidential campaign conventions and debates found little creative thinking, and a slavish blitz of retweeting "elites" like @billmaher and @seanhannity, according to a new study. "Frankly, we're rather disappointed," says Cornell University's Drew Margolin. "Social media has so much potential to improve the diversity of voices and quality of exchanges in political discussion by giving individuals the technological capability to compete with the mass media in disseminating information, setting agendas and framing conversation." Those stars would be Twitter users like the liberal comedian Bill Maher, the most retweeted in three of the four candidate debates, and Sean Hannity, the conservative media personality who popularly opined, "Middle class crushed last 4 years" during the third debate. "Belief polarization"!!! Oh no!!! The country is gripped in a disagreement between people who hate the fact that the President is black, hate immigrants, are really pissed that women have reproductive rights, don't believe science (oh hi, phys.org), want to wage endless war, etc., and other people who think the aforementioned people are dangerous nuts. And the researchers think "polarization" is the problem? Really? As for Twitter, it's a popularity contest where better known people have more followers. Thus well-known tweeters get more retweets. That doesn't mean that Bill Maher tells me what to think. As for my own meager feed of 1200 followers, I'm not sure how Prof. Margolin thinks I should deliberate with the woman who tweeted that I was a "skanky whore" for having had an abortion or the man who said he'd gladly help throw me down the stairs for my next one. I happen to think defeating them at the ballot box is the best course, but maybe he thinks differently. No, the disagreement is among people who hate socialist tyrants like Obama who use the power of the state to attack his opponents, just as they do in third world corrupt states. Why do supposedly educated people support and defend that corruption? "President Barack Obama's administration is knowingly allowing illegal immigrant gangsters from Mexico and Central America into the United States, and some are even being reunited with their family members. The gang members reportedly belong to some of the most dangerous gangs in Central America and Mexico, like MS-13, but Border Patrol agents are handcuffed, especially if the illegal immigrants are deemed to be "minors."" BHO needs to import people who know how to thrive under corrupt regimes. The people at public forums are unbelievably conservative by now. They actively call for censorship of posters and the forum admins are usually helping them with it willingly. This systematical autocensorship is the product of brainwashing of contemporary educational system, but it indeed makes the things even worse. There are many indicators, that the new physics is not complete BS. For example, when the NASA openly develops warp drive, which doesn't require the reactive force for its moving trough vacuum, then it's evident, the number or another reactionless drives (Heims & Woodward drive, EMDrive, Tajmar, Podkletnov and Poher experiments) must have some merit too. The same situation is the with cold fusion: if some reliable experimenters at MIT claim COP over 1000, then even the claims of another researchers cannot be quite unsubstantiated. But the fear of theorists, that this physics would discredit their theories leads to omnipresent suppression of this new research. "Obama Admin Forbids Lawmakers From Taking Photos Of Illegal Immigrant Facility"
""This isn't some totalitarian closed society trying this tactic, this is our own government. They clearly wouldn't be offering up this kind of dog and pony show if they weren't hiding a very ugly truth somewhere."" Not on this site. The people here are unbelievably socialist and actively to suppress any dissent. The recent era of popular science media has built the personality cult around physicists like Einstein or Feynman. I've nothing against establishing of role models for younger generation, but the science simply doesn't work so: it's a very collective effort. In many cases these models were chosen only because they do represent certain ideology or paradigm of thinking ("shut up and calculate") enforcing the lobby of theorists and high school teachers - in this sense they're supposed to act like the saints and martyrs of medieval era. Of course, the lack of ability to think independently has it's objective roots too. The informational explosion has lead the people into blind relying to authorities, who actually decide, what it's good to think about all of it. It introduces the spiral of silence and pluralistic ignorance. So do they suppress any dissent or are they calling for censorship? IMO the problem of liberals often is, they tend to disagree at any price - even under the situation, when the difference in their opinions is infinitesimal. They're individualistic and superficial regarding the opinion of others. 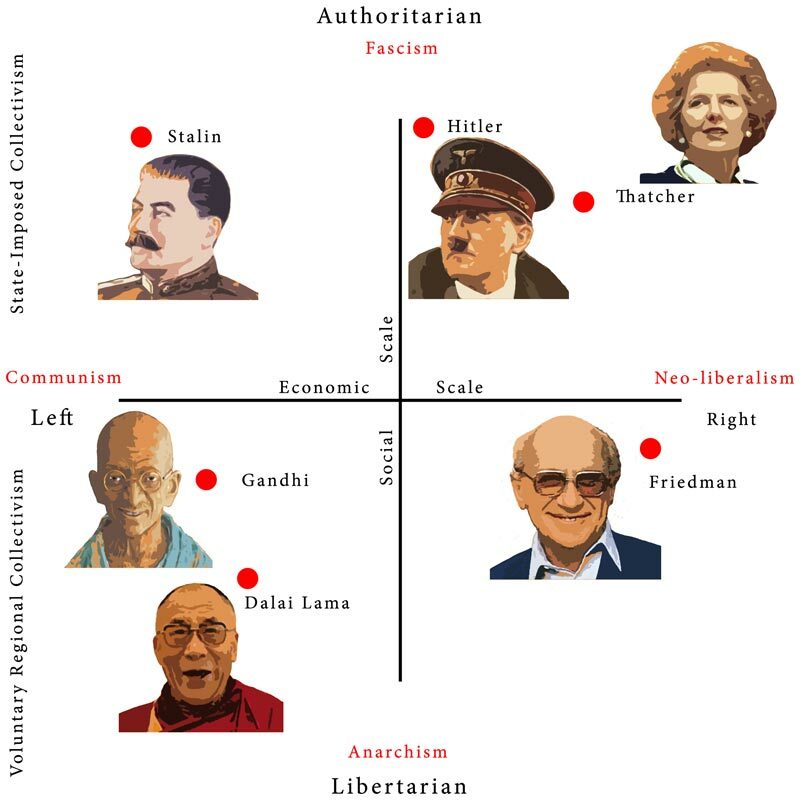 BTW The conservatives can censor the others too - the liberalism and socialism are two independent dimensions of political compass. The equaling of socialists with dissent suppression is just a political labeling: this behavior is characteristic for every extremist stance. rygg, the reason you find people here "unbelievably socialist" might be that you're somewhere to the right of Hitler socially, you poor fucked-up small-minded moron. Hitler was a socialist. He led the National SOCIALIST Party. Socialism is as socialism does. What it does is use the power of the state to control the lives of others. Tyranny of a dictator or the tyranny of a majority is still tyranny. Proof that the purpose of pundits are about opinion shaping not elevating the debate. Not a fan of Chomsky, but he is dead on in his evaluation about how consent is manufactured via the framing of acceptable ideas. Oh, please. How small-minded of you, picking at semantics. By your standards, then, post-war East Germany was democratic, its name being the German Democratic Republic, and likewise for the current North Korea, the Democratic People's Republic of Korea. Do you really think that North Korea is democratic? You must--it's right there in the name, just like the National Socialist party. And you wonder why people find you intellectually dishonest? The NAZIs were socialists. Fascism is another flavor of socialism. Why is this so difficult for 'liberals' to accept? DDR, DPRK are socialist They add 'democratic' to their name to fool the 'liberals' like Jimmy Carter. Socialists need to rebrand themselves when people discover the truth of their tyranny. 100 years ago they called themselves 'progressive'. Then, they called themselves 'liberal'. When the 'l' word left a sour taste, they brushed off 'progressive' again. Regardless of what socialists call themselves, they all want to use the power of the state to control the individual. ""There is no worse tyranny than to force a man to pay for what he does not want merely because you think it would be good for him." I'm not surprised by the result. People who think for themselves have no need to regurgitate the thoughts of others. But he hated (and hanged) the commies (which helped the expansion of Soviet Russia and socialism in East Europe after defeat of Nazi Germany) a lot. Please, explain. Socialism is the power to control the lives of others. German socialists don't want to be controlled by Russian socialists. Stalin murdered Trotsky, a fellow socialist. This is just one example of why socialism always collapses. While purporting to be 'for the masses', socialist states become cults of personality where some animals are more equal than others. Nope, it's the authoritarianism. You didn't understand the politics very much, do you? Hitler tried to manipulate the lives of his peers in the same way, like the Stalin, but he stayed at the opposite side of political spectrum. But there is an interesting aspect of hyperdimensional geometry called the holographic duality, which consist of insight, every extreme stance is similar to its opposite side of spectrum. Actually, even the purple color at the end of visible spectrum is similar to the red end of spectrum and infrared color looks like pink or violet at the phone camera. The extremists tend to be always authoritarians and their methods are therefore similar. The extreme fighters against white racism become black racists, the extreme proponents of formal physics become a vague philosophers (string theorists) etc. Note that extreme liberals become libertarians and if you don't realize the difference, you could easily fight against opposite side of political spectrum thus making your situation even worse. You'll become politically confused. Many people act here so. Socialism is STATE control of property. To quote Hillary on the death of her employees in Libya, "What difference does it make" who or what constitutes 'the state'? Fascism is the fiction that property is privately owned. There are stockholders, deeds, etc. but the state passes all sorts of laws that force the 'owners' to conform to what the state desires. The US Regulatory State is a Fascist state. How do you define 'liberal'? FDR said he was a 'liberal'. Extreme 'liberals' are extreme socialists. Libertarians support a state with limited power, not an all powerful state which 'liberals' support. Call me old school...but 140 characters do not make a good platform for political opinions (at least ones that aren't radically right or left and can be summed up with "hate everything different from me"). If you look at the complex state of social and geopolitical interactions and think you can reduce that to a meaningful 140 character-fart you're living in la-la land. I'm not sure why the researchers should be disappointed. I find it encouraging that a majority of intelligent people are not twits.